This post is about another grass I identified with the help of the book I bought at the Tall Grass Prairie Preserve in October. This one is named Windmill Grass. I first noticed this grass when I found piles of it laying around in areas sheltered from the wind, like this. The dried seed heads had broken off and were blown around by the wind until they came to rest in the corner of one of our cold frames. Here is a closeup picture of one of these. You can kind of see why it is called Windmill Grass. 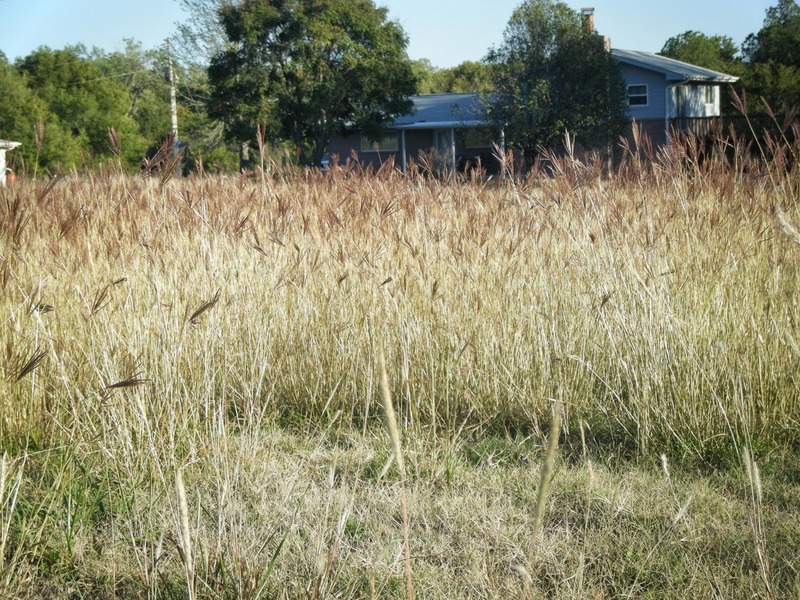 Like Prairie Threeawn, it is another of the native grasses we have here in Oklahoma. We have a small greenhouse that we use primarily in which to raise tomato and pepper plants during the spring. However, this fall we have a few other things going on in it as well. For example, I have some Diffenbachia house plants I am propagating in there. And, here are some Aloe Vera plants. Tom has some lettuce plants he has started in flats. He will set them out in the hoophouse when they get a little bigger and the weather has warmed a bit. This is the best way to start lettuce that will be sold by the head. If you look closely, you can see some red just beginning to appear on some of the varieties, like Lollo Rossa, which have red leaves when mature. Finally, before it frosted, I brought one of the potted tomatoes in. It is doing great and even has blooms! It will be interesting to see if these flowers actually make tomatoes and, if so, whether they will ripen. My last post was about fall grasses. In that post, I mentioned a book that I purchased at the Tall Grass Prairie Preserve gift shop in October. I'm happy to say the book has come in handy and helped me identify a grass named Prairie Threeawn, a very odd name in my opinion. Here's how I happened onto this particular grass. Our cat is an indoor/outdoor cat. Here's a picture of her lounging on the sidewalk. She normally spends the day outside, keeping an eye on things, and comes in at night. As a result of her being outside, she sometimes picks up stickers and other debris in her fur. She's pretty good about grooming herself. But, a few days ago, I noticed some odd pieces of grass stuck in the fur on her tail. I gently pulled them out (she doesn't like for me to mess with her tail) and here is what they looked like. Each one had three spikes at the end attached to one main stem. I dug out the book I purchased on our trip to the Tall Grass Prairie Preserve. And, found that these came from a grass called Prairie Threeawn. From the book, I learned the spikes at the end of each stem are called "awns", thus the name "threeawn". The book says this grass tends to thrive in poor soil and that there are seven species in the 3-state area covered by this book. It also says it can cause injury to grazing animals. I assume this means the awns can stick in an animal's eye while its head is down close to the ground. That seems likely as they certainly were stuck tight in the cat's tail and felt quite prickly to me. Back in October, we made a trip over to Pawhuska, Oklahoma, to attend an open house at the Nature Conservancy's Tall Grass Prairie Preserve. It was a beautiful day. We took a picnic lunch, listened to talks about the resident buffalo herd and took a short hike. I also purchased a t-shirt and the following book at the gift shop. The clumps of Bluestem shown in that article have turned reddish-brown and stand out beautifully in contrast to the snow in this picture. I've never paid much attention to grasses, I guess because my eyes were distracted by the much showier wildflowers. I wrote a blog entry on those, too. However, in the fall, most of the wildflowers are gone and the grasses begin to send up seed stalks. I took several pictures of various grasses this fall. Unfortunately, I didn't buy the grass book in time to be able to identify most of them. But here are the pictures I took. I know a lot of folks who want immaculate lawns and cannot stand it if their grass gets over 2 inches tall. I'm happy to say that I'm not one of those folks! I love the bio-diversity of the small prairie that we have created around our house. I was leaving to go to town the other morning when I noticed a furry animal down near the deer feeder. 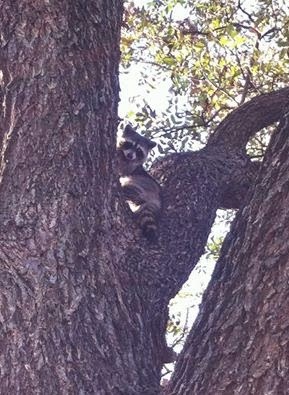 It looked like a raccoon, but we normally do not see them during the day. As I cautiously approached it, it turned to look at me and there were the trademark bandit mask around its eyes. It stared at me and I stared at it. It was a stand-off. I worried that something was wrong for it to be out in broad daylight. But, as I approached, it ran over to a nearby tree and started to climb. It stopped at the first large branch and looked down at me. It was very shy and tried to stay on the other side of the tree from where I was. I decided it was a young raccoon who had not yet learned to stay hidden during the day. Or, perhaps it was just very hungry. At any rate, I went on to town thinking it would be gone by the time I got back. This tree is only about 30 feet from a creek and most of that 30 feet is covered with brush and tall grass. So, there was plenty of cover in which it could hide. When I got home, I didn't see it and breathed a sigh of relief. I really did not want a raccoon hanging around this close to the house and chicken coop. Raccoon are notorious for killing chickens and, with their dexterous "fingers", they are able to undo latches and things that most animals cannot. However, my relief was short-lived as later in the day I noticed something round far out on a limb, high up in the same tree. At first I thought it was a squirrel nest. You know how squirrels make nests out of small branches and leaves. But, this just did not look quite like that and while I was observing this "thing", it moved. It was the raccoon. It was curled up in a ball and appeared to be waking up from a nap. I knew it would come down as soon as it got dark and I was worried. The outside door of the chicken coop is only secured by a hook-and-eye sort of latch. To easy my worry, Tom went to town and bought a better latch to go on the door. Also, a friend suggested that we try to trap the raccoon in a "live" trap and relocate it. Thankfully, we have a larger trap than the one in which we caught the opossum recently (Mouse Trap Mystery). During the night, our wildlife camera captured pictures of the raccoon after it descended to the ground. I love the look on the deer's face! Luckily, the raccoon ventured into the trap shortly after these pictures were taken. Here it was the next morning. I felt really sorry for it because it was obviously scared. I put a blanket over the cage until Tom had time to haul it off. He took it out to a secluded area beside a creek and let it go. Hopefully, like the opossum, it learned from this experience and will stay well away from humans in the future. Along with autumn and cooler weather comes an abundance of winter squashes: pumpkins, acorn squash and butternut squash, among others. My favorite is butternut squash and my favorite thing to make with them is soup. The recipe I use is one that I created combining several recipes that I found on the internet. It is simple and quick. Here's what you do. Roast a butternut squash by cutting it in half and putting it cut-side down in a pan. Add about half an inch of water to the pan and cook in a 350 degree oven until the squash is tender when pierced with a fork. Let the squash cool and peel it. The peeling should come off easily. Then mash the squash and set aside. When the onions are translucent, add 3 cups of chicken broth or vegetable broth. Or, mix the two and use 1.5 cups of each. Bring to a simmer and cook until the carrots are tender. Then, add the mashed squash. Heat to a simmer and add 1/4 teaspoon of Nutmeg. At this point, you have to puree the soup. You can do this using a counter-top blender or an immersion blender. If you do it using a counter-top blender, you will have to work on batches of about 2 cups at a time and be careful to not let any of the hot soup splash out on you! I like to use an immersion blender, like this. Puree the soup until it is creamy and smooth. Then add 1/2 cup of half and half. Adjust the seasonings by adding salt and pepper to taste. I add a little more nutmeg as well. The finished soup is creamy and sweet and reminds me of the Pumpkin Lattes you can get at the coffee shops this time of year. A few weeks ago I wrote an entry about the cayenne peppers that I was drying. At that time, I also had a few Poblano peppers that I wanted to dry as well. I tried stringing them up, like I did the Cayenne peppers, but they were too large and thick to dry well and most of them ended up getting moldy. So, I decided to de-seed them, cut them into pieces and dry them in my dehydrator. 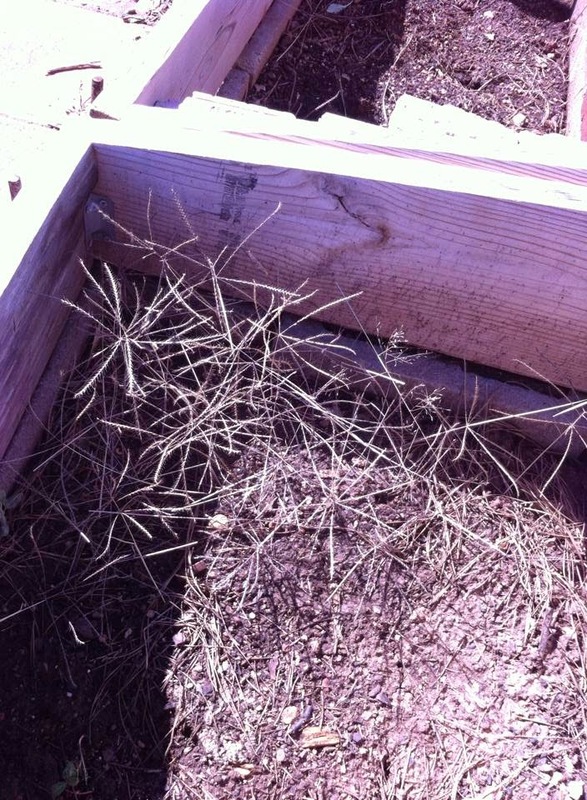 Afterwards, I had a bunch of seeds that I thought might be of interest to the chickens. I put them in a pan and stood back to see what they would do with them. It turned out that they loved the pepper seeds and ate every single one. The three old girls were first to investigate. But, before long the younger chickens showed up to check things out. At the time I took this picture, we still had Pretty Boy, the rooster. That's him on the left examining a piece of pepper. He would have made a fine rooster. However, I have noticed more intermingling between the young hens and the old girls since we sold him and the flock seems to be a more cohesive unit now. So, I feel we made the right decision to let him go.